Seen at Whole Foods stores recently…. 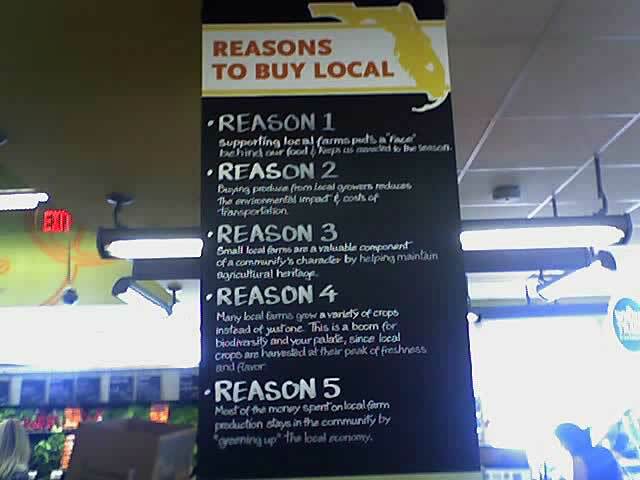 The store in South Beach is proud to support local growers. 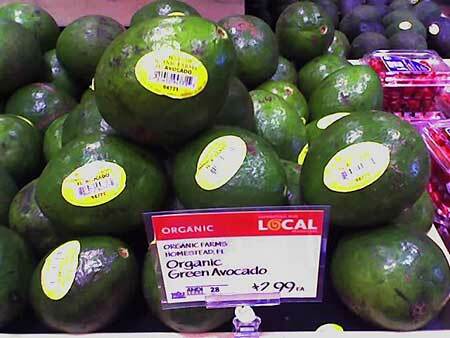 The Aventura market had local, organic avocados from Homestead Organic Farms. Local avocados from Homestead Organic Farms, next to grape tomatoes from Lady Moon Farms (which are not local, not this time of year). Locally grown round red slicers. Dan’s field of tomatoes in pots. Read the fine print. This tomato came from Mexico. And people bought it because it’s cheap. The tomatoes were delicious and beautiful, but financially the crop was a disaster. Startup costs were much higher than if he had planted directly into a fertile field. The potted plants required a lot of input — fertilizer and insect control sprays — plus you have to take into account the cost of soil, pots, landscaping cloth, irrigation and labor. “It cost me seventeen thousand dollars gross to set up, and my net was damn near nothing,” Dan grumbled. 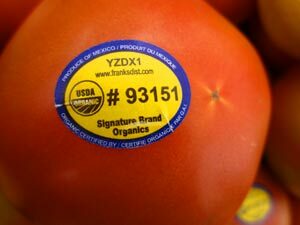 Just as Dan was starting to harvest a few weeks ago, round red organic tomatoes from Mexico flooded the local market. (You might have seen them at area stores.) Thanks to NAFTA, the dollar-peso exchange rate, and low labor costs, organic tomatoes from Mexico were wholesaling for a lot less than what Dan was asking for. No way he could make a profit. And he was stuck with bushels of tomatoes he had to unload. So he sold them at cost to farmer Margie of Bee Heaven Farm, and everybody in her CSA, large and small shares alike, got round red tomatoes. And, there’s Florida 47s to be had at the Keys Gate Farmer’s Market on Saturdays, and Pinecrest Gardens Farmers Market on Sundays, while they last. Mexican produce aside, growing organic tomatoes in pots was an interesting experiment, but not one Dan cares to repeat any time soon. “It’s not sustainable,” he said. He is sticking with growing slightly more profitable green beans grown in a field of real dirt. It’s a gamble he knows how to win a bit better, providing there’s no hard winter freezes. “You want to know how to make a little money in farming?” Dan asked. “Start with a LOT of money.” And he laughed long and hard at his familiar joke. Happy Thankgiving to all my readers out there! When you sit down to your holiday feast, don’t forget to give thanks for all the farmers who worked hard to bring you those fresh, local organic green beans, maybe the heritage turkey, and the other delicious things on your table. Thanks to Margie Pikarsky of Bee Heaven Farm, and her family and helpers for providing me with some of the freshest and healthiest food I’ve eaten, and for extending their friendship, kindness and generosity. Thanks also (in no particular order) to Chris and Eva Worden, Robert Barnum, Dan Howard, Hani and Mary Lee Khouri, Cliff Middleton, Gabrielle Marewski, Steven Green, Muriel Olivares, Miguel Bode and Mario Yanez. This blog wouldn’t exist without their cooperation. Their farms wouldn’t exist without your support. Eat local! Have you thawed out yet? We had two weeks of record-breaking cold temperatures this month. It seemed each night a new low was recorded, and the cold went on for the longest stretch anyone could remember. “I’ve been down here for 40 years and I’ve never seen a cold snap like this,” marveled Cliff Middleton of Three Sisters Farm. And this long cold spell did break yet another record. Beginning January 2nd, we had 12 days in a row of temps dropping below 50 degrees, and came one day short of breaking the record of 13 days straight, set in Miami in Jan/Feb 1940, according to the National Weather Service. The weekend of Saturday January 9th brought historic lows that were well below freezing. And by the wee hours of Monday January 11, hopes of any chance of crops escaping harm died as the temperature dropped into the high to mid 20s and stayed there for several hours. That was long enough to destroy cold-sensitive plants. Green bean field, Homestead Organics. Taken on Friday Jan. 8, before the last freeze. Same green bean field, Homestead Organics. Taken on Friday Jan. 15, after the freeze. 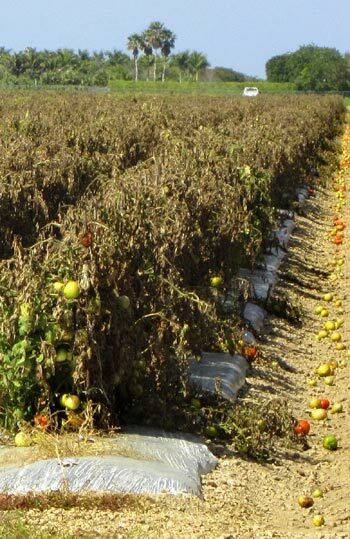 The growers of Redland Organics got hit hard by the freeze this past week. 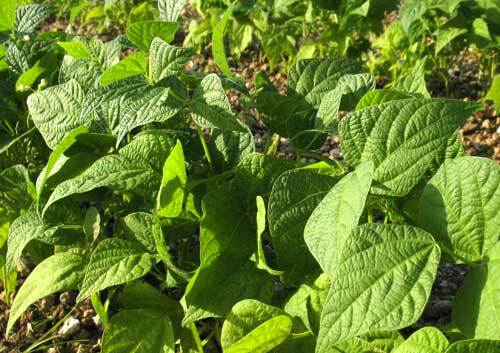 Dan Howard of Homestead Organics had five fields planted with green beans. He watered the crops for days to protect them from the cold. But early Monday Jan. 11th, the temperature fell as low as 28 degrees on his front porch, with the coldest temps around 4 – 5 a.m., and it stayed below freezing until dawn.There was no fighting it. All 22 acres of green beans were damaged. “Farmers gamble with the weather and are risk takers,” Dan said. Sometimes they gamble and lose. Because of the freeze, Dan says he lost $100K in sales. He has crop insurance, but since beans are not a specialty crop, insurance will only pay for seed and fertilizer and not much more. He’s all ready to replant, though. “Don’t have much of a choice otherwise,” he laughed. The Friday before the last freeze, he cultivated one field, preparing the soil for planting. And just the other day he loaded his truck with bean seeds and was ready to start over again. Robert Barnum of Possum Trot got patchy frost in his grove, and is concerned about long-term damage to his sensitive tropical trees. He grows 300 types, and caimito, anona and guanabana are the most cold sensitive. “The cold will kill cambium, the growing layer between the bark and the wood,” Robert explained. Branches or a trunk less than four inches in diameter will die more easily, depending on how cold the temperature falls and for how long. “A tree looks OK for a while, and then the damage shows up later. Some damage takes months to show up. Lots of things can show up. Buds might not form, or form small, or not set fruit and drop off,” he said. Sounds like there might not be as much fruit this summer, but time will tell. Heirloom pole beans damaged by the cold. Bee Heaven Farm, Jan. 15. 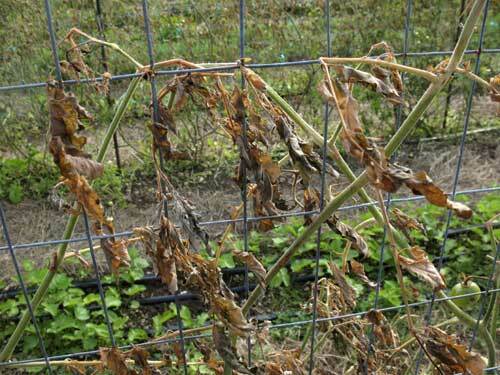 It was simply too cold for too long, and pole beans and heirloom tomatoes at Bee Heaven Farm didn’t make it. Margie Pikarsky and her crew covered them up with Reemay (floating row cover) for two weeks. The plants made it though the first freeze right after New Year’s, and at first it seemed like they would survive the cold. But Reemay wasn’t effective on that fateful Monday morning. Pole beans, including the dappled Dragons Tongue beans blogged about on Mango & Lime are pretty much all dead. Leaves are burned and withered, and it’s uncertain if the plants will have enough energy to grow new leaves and blooms. The heirloom tomatoes are also pretty much destroyed. Don’t expect too many heirloom tomatoes this season at the farmers market. Read more about the freeze at the Bee Heaven Farm blog. Not all was lost, though. I saw carrots, radishes, kohlrabi and dill looking no worse for the wear. Heirloom tomato plant completely destroyed by the cold. Bee Heaven Farm, Jan. 15. Gabriele Marewski of Paradise Farms covered her raised vegetable beds with Reemay and her vegetables survived, along with the microgreens. But the edible flowers that she is known for did not. “They were vining too much and it was almost impossible to cover them all,” she explained. “The flowers are a total loss.” Crop insurance doesn’t cover edible flowers or microgreens, and considers them “experimental,” and the quantities she grows are too small to get coverage. Oyster mushrooms slowed down because of the lower humidity, but Gabriele expects a big flush of growth as it warms up, and plenty of mushrooms in time for market this Saturday. So, for the next month or two, pickings might be slim when it comes to local produce. You just may not find some things (like beans) that you got earlier in the season, at least not for a while; and other things (like heirloom tomatoes) may not be available at all or in very limited quantities. 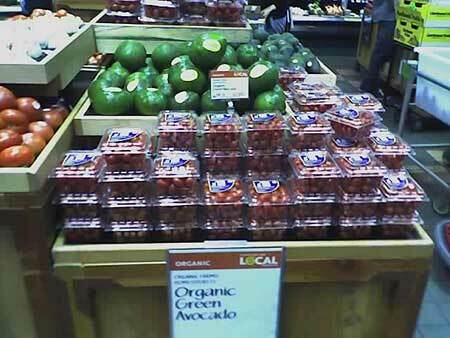 Despite that, do make it a point to support your local growers when you shop at farmers markets and grocery stores. They need your help to bounce back from their losses. Healthy green bean plant, before the freeze. 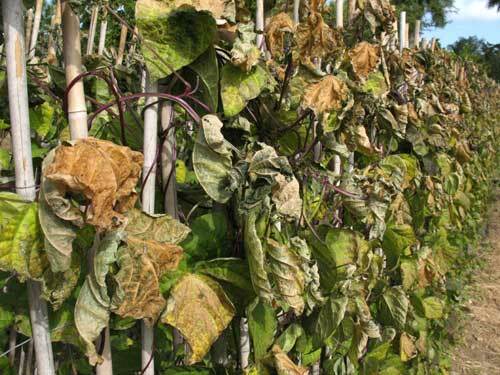 Damaged green bean plant, after the freeze. Record-breaking cold temperatures rolled in, and a freeze warning was issued for several nights in a row this week. The farmers in Redland scrambled to protect their crops from the freezing cold, but generally fared well. 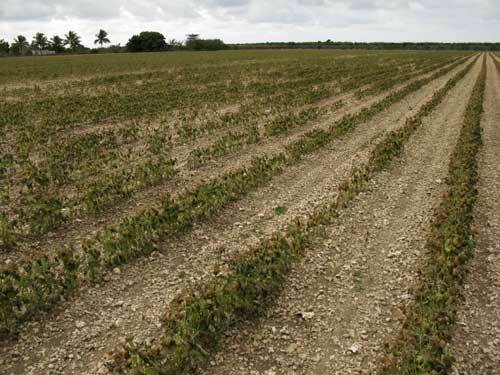 CSA growers located further north — Worden Farms in Punta Gorda, and C&B Farms in Clewiston — got frost damage on Tuesday night. They’re still evaluating how much damage they got, and if any crops were lost. 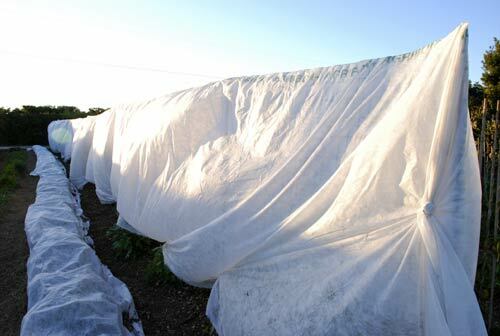 Reemay, or floating row cover, protects delicate greens and pole beans against freeze damage. Margie Pikarsky at Bee Heaven Farm protected delicate basil, heirloom tomatoes, and pole beans with large sheets of Reemay, or floating row cover. It’s a spun polyester fabric that is used to cover plants, much like a blanket. The row cover acts like a blanket to hold in the heat and keep plants warm. Margie added she’s not watering as much, because that runs the risk of plants mildewing, or hot condensation cooking entire plants. Her crops have been covered since the first freeze warnings on Saturday, and the Reemay will stay up until the cold blast forecast for this coming weekend. On Wednesday afternoon, Dan Howard of Homestead Organics, was cautiously optimistic. “Tuesday night it went down to 33, 34 degrees, but not a killer freeze,” he told me. 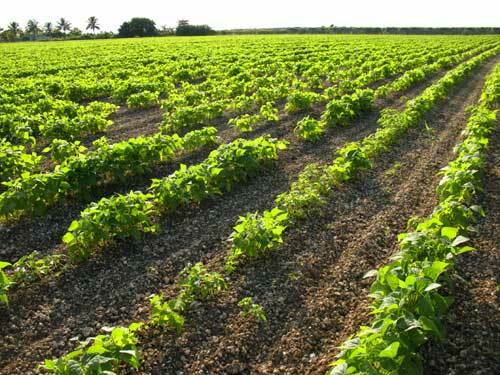 He had prepared his bean fields by watering them quite extensively during the day on Tuesday. (It’s just too much acreage to use row cover.) Dan explained that his crews “soaked the ground down real good. Water insulates the ground to keep it from getting colder. Well water is 75 degrees, the same temperature year round. Dry ground gets colder than wet ground.” He explained that ground temperature is the most important for the plants, keeps the roots from freezing. 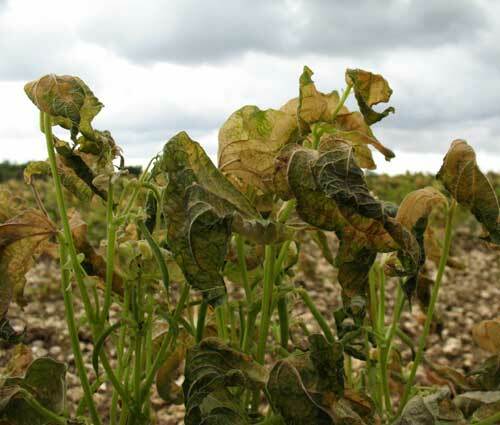 If the temperature gets below 32 for any length of time, plants will become permanently damaged from the cold. “Anything below 32 is bad, and at temps of 28, 29 degrees, it’s a total loss,” Dan explained. Monday night wasn’t that severe because there was a blanket of cloud cover, which acted as insulation and kept the temperatures from dropping too low. Tuesday night the sky was clear and temperatures dropped — but it was windy, and that made a difference. The moving air keeps ice from forming on the leaves. “If there’s no wind and clear sky, you get frost,” Dan said. And frost is what kills plants. It coats the leaves and burns them much like frostbite. Leaves turn black and wilted from the damage and the plant will die. Farmers can knock ice off the plants by spraying fields with water in the middle of the night, Dan explained. That’s why they’re up all night, watching the temps, checking the plants watering in the fields and groves. In a similar vein, Robert Barnum of Possum Trot Nursery watered his tropical fruit grove on Tuesday night. He has giant pumps to draw well water, and tree-high sprinklers dotted through his grove. Tuesday night temps dropped to 36, and Robert was up at midnight and again at 3 am watering and checking on his trees. He explained that water gives off heat as it freezes, 353 kilocalories per gram of water to be exact, and that bit of heating warms the plants. Once the water on the plant freezes, it keeps the temperature constant at 32 degrees even if air temperatures drop below that, because a heavy coat of ice acts as insulation. But you have to keep watering, he insisted, to keep that small but important heating process going. By Wednesday night Robert was less optimistic than Dan, and said the thermometer already read 39 degrees at 9 pm. The sky was clear and the winds were dying down. It looked like there would be a killer frost that night. Margie said the temperature dropped hard and fast — and then something unexpected happened. Some light cloud cover rolled in, and those clouds were enough to act like a blanket keeping heat from radiating away from the ground at night. Temps hovered around freezing, then came back up a bit. “I never saw anything like that,” Margie told me. But the main reason why the anticipated killer frost didn’t happen, according to Jonathan Crane at TREC: when the temperature fell to 35 it also reached the dew point. When the temperature meets the dew point, heat is released and the temperature rises, and that is what happened on Wednesday night. (There might have also been a bit of ground fog.) End result, no freeze, and crops were spared — this time. A more severe blast of cold air is forecast for the weekend, and growers (especially to the north of us) are bracing themselves. To learn more about how frost forms and dew point, take a look at this web page. Today, Americans will take time to sit down and share a Thanksgiving meal with family and friends. Now, more than ever, I am thankful for those who provided the Thanksgiving meal. I am thankful to live in the United States where the average consumers spend about 10 percent of their disposable income on food, compared to those in India who spend more than 50 percent. According to the American Farm Bureau Federation, menu items for a classic Thanksgiving dinner dropped 4 percent in price this year. I am thankful that I have the opportunity to serve the people who grow our food. If you bought fresh pole beans for Thanksgiving dinner, then family farmers Larry and Mark Dunagan grew them with care in Redland. If you’re enjoying squash, then family farmers such as Arturo DeLeon, Angela DelliVeneri, Sal Finocchiaro, Vito Strano and Eric Torrese grew them with pride in South Dade. Family farmers such as John Alger and Robbie Martens grew the super sweet corn in the fertile fields of the East Glade. 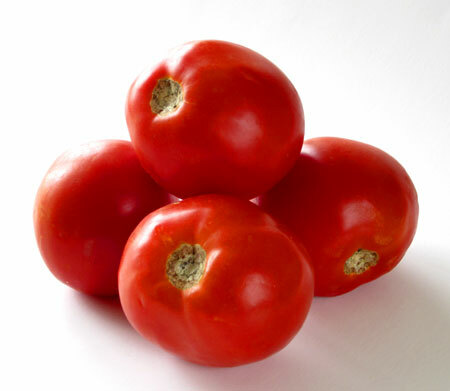 The red tomatoes you’re enjoying were grown by family farmers such as Freddy Strano, Kern Carpenter and Ed Hagan. The green beans for your casserole were grown by family farmers such as Bruce Dunn, Leo Talarico and Dan Howard. There are so other many family farmers in Miami-Dade County who deserve our thanks for growing safe, affordable and abundant food. I am thankful for the efforts of Donna Reno, Gabrielle Berryer and Hani Khouri, who are helping consumers reconnect with their food source through Slow Food. I am thankful for the work of Charles LaPradd of Miami-Dade County, who helped launch the Redland Raised regional marketing program at Publix Supermarkets last month. I am thankful for Gabrielle Marewski of Paradise Farms. She cultivates interest in local agriculture from chefs and foodies. 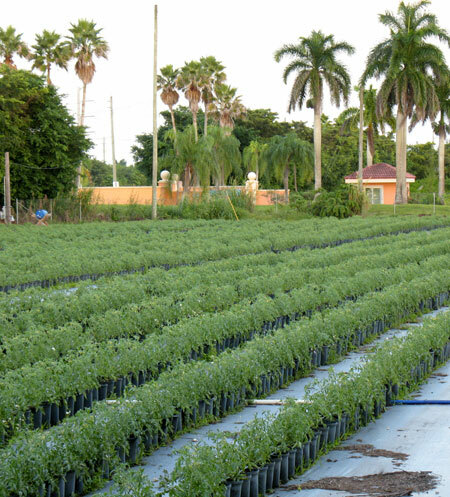 The South Dade farmer holds many titles — businessperson, steward of the environment, neighbor, community leader and grower. Taking seed, soil and water, this farmer produces not only a crop but an economic impact of $2.7 billion and provides jobs for about 20,000 people. Privately owned agricultural land provides wildlife habitat and is an aquifer recharge area. All the farmer asks for is the opportunity to make an honest living growing food for a hungry nation. All of our farmers, large and small, deserve thanks every time we eat. We take many things for granted. America’s farmers should not be among them.